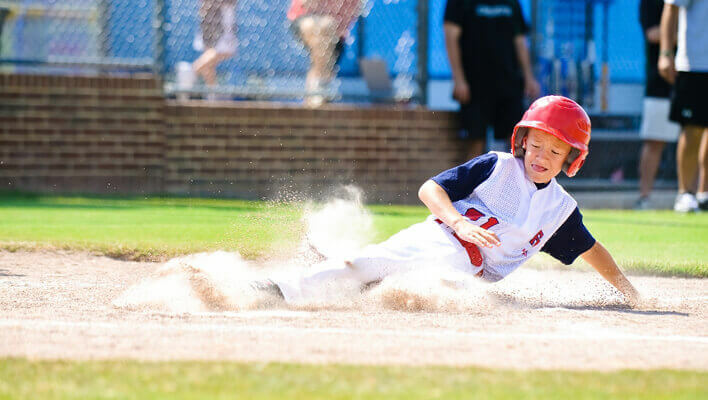 Baseball teams offer excitement and the opportunity for kids to develop hand-eye coordination and team-building skills. Cooperation and good sportsmanship are highlighted, and kids get the chance to be active and have fun to boot. Baseball players will already have established relationships with businesses in the local community and be recognized locally. Whether local papers feature game stats, or city competitions are held with different teams in the city, baseball teams get attention. Kids' teams always need funds for uniforms, equipment, and the fees associated with renting out space and making it to away games. Luckily, hometown pride and excitement about the local heroes can help drum up some ideas and donations for the team. One way to raise money for your team is to sell branded sports memorabilia such as stickers, flags, keychains, and t shirts at each game. Baseball teams usually have home games and away games, so it's a good idea to have a table that is portable and easily stored, and can be set up at all the games, no matter where they take place. You might enlist parents or fans of the team to man the booth. Consider creating a catalog of the items available for sale. Parents can bring it to PTA meetings and other community activities outside of baseball games to help get the word out. Kids can also take them home to show their families while asking for support. Food sells well and is always a great way to raise money. Parents and siblings can help team members bake baseball-themed treats to sell at the games. Why not decorate cupcakes and muffins with baseballs, or sell baseball shaped gumballs and chocolates? Check grocery and kitchen supply stores for cookie cutters in the shapes of team flags, baseball bats, or the team's mascot. You can also prepare themed goody bags shaped like old fashioned popcorn containers, or use white bags with the team logo. Fill them with baseball themed pencils, erasers, whistles, and baseball cards. You could also design a baseball themed cake with a wafer scoreboard held up on pretzel sticks, marshmallow bases, a graham cracker infield, and icing to draw the lines. Then run a raffle for the cake by using baseball themed tickets, or those imprinted with the team logo and name. Another option is to host a fundraising dinner event where people can dine with the members of the local semi-professional baseball team. Or enlist these players to serve in a local coffee shop in full uniform. Why not see if these players are willing to put together a team calendar or sponsor branded magnets that can be sold in local shops to raise funds? Or auction your players off to members of the community, for dates or to help with chores in the yard while wearing their uniforms! Baseball offers a great theme for a carnival as well. Serve hot dogs and popcorn, have team members help people learn how to hold a bat and hit well, and then invite folks to play a game too. You can even rent a dunk tank and have people buy tickets to dunk the coach. Chips and dips can be served in small helmets, and miniature baseball trophies from the dollar store can be handed out as prizes. Consider other carnival options as well, and ask businesses whether they're willing to provide sponsorship in exchange for extra coverage at games. Everyone loves a carnival, and they can be held any time of year to coincide with seasons and holidays. When the teams are willing to help out, you have a great combination of energy, excitement, and fun. Passing out catalogs of cheeses, chocolates, or wrapping paper, can be overdone through school fundraising efforts,. You may want to avoid them for your team. There's no need to choose the same fundraising products you can use for anything, when instead you could be using products and ideas that keep that team spirit in mind. You can give the kids a great chance to have fun and continue that baseball team-building spirit in their fundraising efforts. Encourage them to run a coaching clinic to raise their confidence as well as money, and get parents to help out as well.